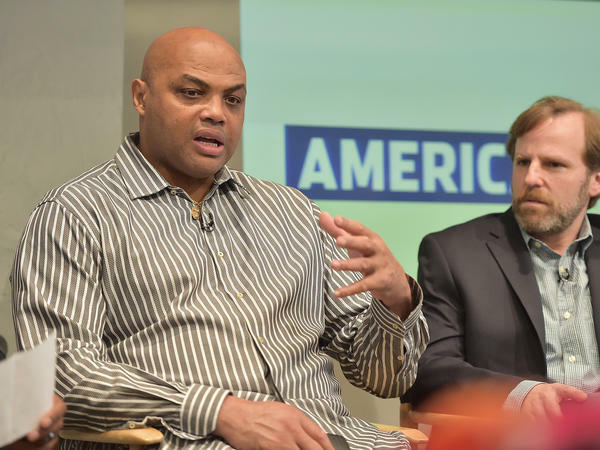 Charles Barkley and executive producer Dan Partland speak during the American Race Press Luncheon in May in New York City. That "American Race," the new TNT docu-series about race hosted by Charles Barkley, manages to illuminate some truths about the way Americans talk about race is largely accidental. Over its four episodes, the impolitic former NBA star travels to different parts of the country trying to dig into racial controversies that have bubbled up locally; at each stop, his insights don't go much beyond platitudes about America being made up of people from different backgrounds trying to carve out better lives for themselves. That doesn't mean that "American Race" isn't revealing, in its way, about how Americans think about race. Barkley reminds us repeatedly that he wants to start a dialogue — which is all he reveals about his motivations for doing so. And like so many other self-appointed dialogue-starters, Barkley seems mostly indifferent to the extent that conversations he's wading into and their contexts predate him. In the series' first installment, Barkley spends a day training with Baltimore police officers and playing out scenarios in which they might have to fire their weapons. He then heads to a town hall at a black church in the city, during which he tries to impress upon the all-black audience how difficult it is to be a police officer. (Just to up the degree of difficulty for his pitch, he also rattles off some numbers on black-on-black homicides, with an implicit finger-wag.) "I spent the day with the cops...we're talking split-second decisions," he tells the visibly restless audience. "They can do 95 percent of things correct, and five percent screw up, and we spend all of our time talking about the five-percent [who] screw up." While the folks in the town hall audience are polite to Barkley at first, they're also not buying what he's selling. One woman stands up and identifies herself as the mother of Tyrone West, a man who in 2013 died in mysterious circumstances while in police custody. "I don't know you, I don't like you," she says to Barkley. "You said you rode with the police and you had a conversation with them and it takes them only a split second to make a decision. Tell me why it took 15 to 20 minutes to beat my son to death." "Racism exists, but what I want to do is start a dialogue," Barkley offers as a rejoinder. He means it to sound open-minded; instead, it comes off as dismissive. The crowd becomes louder and more unruly from that point, and understandably so: the residents of Baltimore's black neighborhoods and the city's police have, in a sense, been engaged in a pointed, seemingly endless discourse about race and police violence for decades before the death of Freddie Gray in 2015 became national news. But the intractability of the problem of police violence in Baltimore — and the fact that it's hardly specific to Baltimore — makes calling for civil dialogue and common ground insufficient. And Barkley is hardly alone in thinking this way. Americans have a deep, abiding belief in the effectiveness of dialogue when it comes to issues of race, which tend to be cast as problems fueled by insufficient empathy to be ultimately resolved with greater understanding. It's such a well-intentioned impulse that talking about how it can also be distracting — even counterproductive — makes the person pointing it out sound like a cynic. But perhaps it matters less to the reduction of police violence whether an individual officer harbors implicit bias that she might be able to unlearn — or has friends of color or is a person of color herself — than whether officers and law enforcement agencies face realistic consequences and constraints on their authority. These aren't intractable problems simply because citizens don't trust or understand cops and because cops don't respect citizens. These are intractable issues because they are fundamentally about our deep, entrenched and unbalanced arrangements of power. That faith in the restorative potential of sitting down and talking it out courses through "American Race," and is what ultimately makes it so frustrating to watch. Effective dialogue, the kind Barkley says he wants to promote, probably requires a few things: the good faith of the actors and a sense that the stakes are, if not equal, then at least to some extent shared. But there's something naive, if not dishonest, about treating the stakes in this situation — in which the police enjoy institutional authority, a broad discretion to use force, near-total job security and wield state-issued firearms — as symmetrical, as though individual members of the public, who have none of those things, enter any engagement on the streets or in a debate setting, on the same footing. There are moments when Barkley's awwww-shucks good faith in dialogue goes to absurd extremes, like when he sits down with Richard Spencer, the white nationalist media fixture, to debate whether white privilege exists. It's obvious that this discussion could use a more nimble moderator than Charles Barkley. But it's not clear what "American Race" hopes to illuminate by hosting the exchange. Does Barkley think he might change Spencer's mind after a cordial chat? (Or, more distressing, does Barkley think Spencer has some possibly valid points that are worth hearing out?) Does he think that Spencer, a man who wants an separate nation for white people, represents the median skeptical position on white privilege? None of that is clear, but "American Race" allows Spencer to calmly and dryly explain why he thinks white supremacy is an important endangered concept, as if he and Barkley and the other guy in their sit down were having a courteous disagreement over marginal tax rates. It's as if Barkley had never considered how much packaging noxious ideas in the trappings of "civil dialogue" might unintentionally spray those ideas with the scent of reasonableness. While in Irving, Barkley meets Sharmina Zaidi, a Muslim activist whose family runs a local restaurant. In the past, Zaidi reached out to her neighbors to invite them to her home for dinner, an attempt to get them to see her and her family as proud, hard-working Texans and not extremists-in-waiting. She was, you know, trying to start a dialogue. It didn't go so well, as Barkley acknowledges. "She tried this once before, but nobody came," he says. Zaidi tries again, inviting all of her neighbors over to break bread. It goes only a little better the second time. "Nobody came except for one other family, and they were Muslim also," Barkley says. "So that was frustrating and disappointing to me." The city's mayor also declined the invite. Despite the mounting evidence in front of him about the limitations of his approach, Barkley remains naively optimistic. "I truly believe that building bridges, not building walls and not giving into fear, will make our communities better," he says into the camera. He'll keep offering up seats at the table, even if no one is coming to dinner.